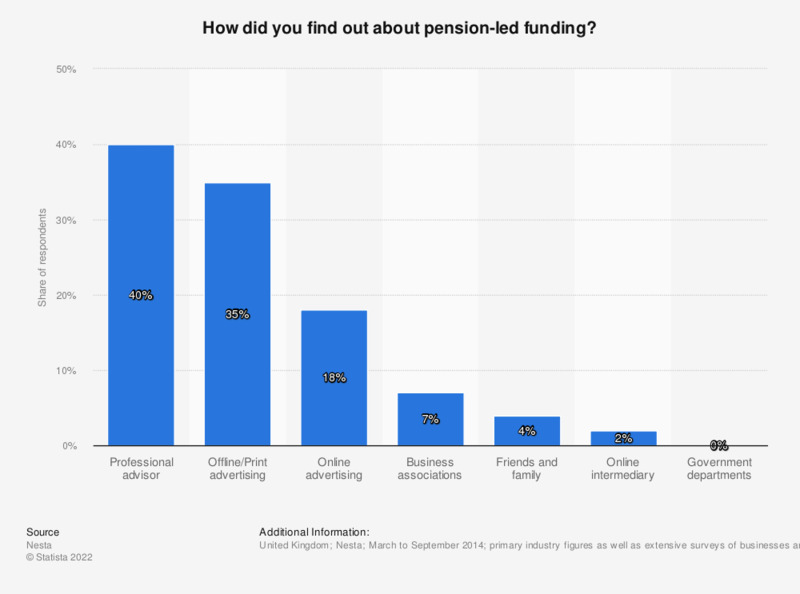 How did you find out about pension-led funding? This statistic shows the main sources of information on pension-led funding (a type of alternative finance) accessible in the United Kingdom (UK) as of 2014. According to the survey, 40 percent of respondents learned about this type of funding from a professional advisor. The source adds the following information: "Pension-led funding allows SME owners or directors to use their accumulated pension funds in order to invest in their own businesses". The source clarifies the methodology as follows: "Four stages of research activity were carried out from March to September 2014. (1) Stage one involved collecting primary transactional data directly from alternative finance platforms. (2) Stage two consisted of designing and distributing model-specific questionnaires to survey funders and fundraisers of alternative finance. In total 15,658 users were surveyed. (3) Stage three conducted in association with ACCA and PwC included two external national surveys to understand the level of awareness among consumers of alternative finance. 2,007 consumers and 506 SMEs were surveyed. (4) Stage four was the industry-wide tracking survey among UK crowdfunding associations and P2P associations to gather industrial figures for year 2014. Transactional data was collected for quarters one to three of 2014." In which sector does your company/organisation operate? How important are the following in your decision to invest in businesses through equity-based crowdfunding? Having failed to raise funds through reward-based crowdfunding would you try it again in the future or recommend to someone else? United Kingdom: When you budget for investing through equity-based crowdfunding, where does the money come from? United Kingdom: What would you otherwise do with the money you use to back crowdfunding campaigns? How much money have you used to fund through the site? How important are the following in your decision to invest in organisations/projects through community shares crowdfunding?